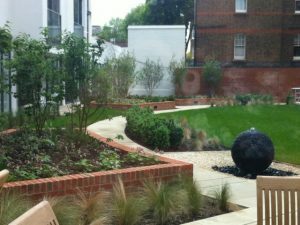 The newly planted gardens at Battersea Place are starting to fill out already having been planted a few weeks ago, the multi-stem birches and Amelanchiers are in leaf and the pink geraniums are in bloom. This soft woodland style planting scheme creates tranquil feel in the courtyard for the residents to enjoy. The planting consists of a selection of perennials which flower at different times of the year including Geraniums, Agapanthus and Tiarella the structure is provided by multi-stem trees and clipped box hedging with feathery grasses to soften the hard edges. We provided the construction details and planting design for this landscape scheme designed by Leighton Buzzard based landscape architects Bowles and Wyer and we were very pleased to be on the team.